We had a blast doing DaVinci's Challenge at Quest Room. A good range of puzzles and the production quality was top-notch. HIGHLY recommend. Plus a big thanks to Ben for being such a great host! You live in Italy in the year 1493. The name of the Master Leonardo Da Vinci is known all around the world. Hundreds of students start to follow him, hoping that grand inventor will take them under his wing as an apprentice. There are so many young hopefuls, that Da Vinci built a room specifically designed to select candidates. Only the students capable of exiting this room in one hour will be granted the honor to learn from Master Leonardo! Reviews of escape game "Da Vinci's Challenge"
We did the DaVinci room and it was so much fun! Just challenging enough to make it through and the props were so cool (there was a complete in-awe moment, you'll know it when you see it!). I've done 4 escape rooms before and this one is in the top 2. I'll definitely be back for more. The Da Vinci room was a super fun room with lots of interesting puzzles and a great theme. I'd definitely recommend! My friends and I did the Da Vinci Challenge today and it was a great experience. It was the first escape room for 4 out of 6 of us, and we managed to escape in 39 minutes. Our host was wonderful. The production value was top notch - some of the puzzles were engineered brilliantly. A couple of things were a little hard to trigger but we got there eventually - you just have to be very specific with placements! Nothing in there felt 'cheap', and it was certainly challenging. We all enjoyed ourselves and I really want to come back to do The Bloody Elbow! Terrific escape room! We did the DaVinci room and it was really outstanding. I've done at least 20 escape rooms and this was one of the best-themed rooms that I've done. From the moment you walk in, they give you costumes to wear to get in the spirit of the period. 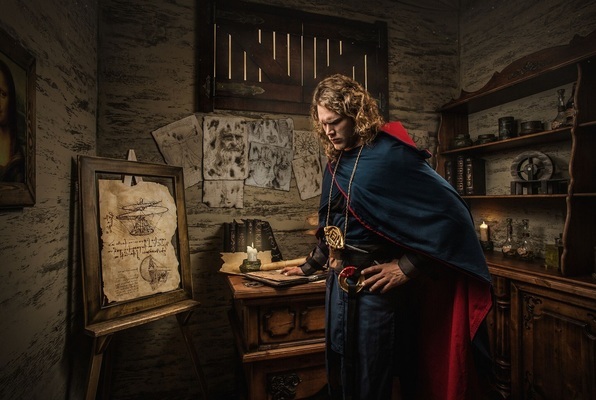 Then, when you enter the escape room itself, you are immediately transported to another time and place. The escape room is really well-designed to match the theme, and the puzzles are also related to the theme. This is not a simple "find the key" and unlock the lock room. You actually have to use your brain for some of these puzzles. And the unique part of this room is that you're separated from half of your team to start (and you have to work with them to find a way to get together and complete the challenge. Well done! I highly recommend this room!